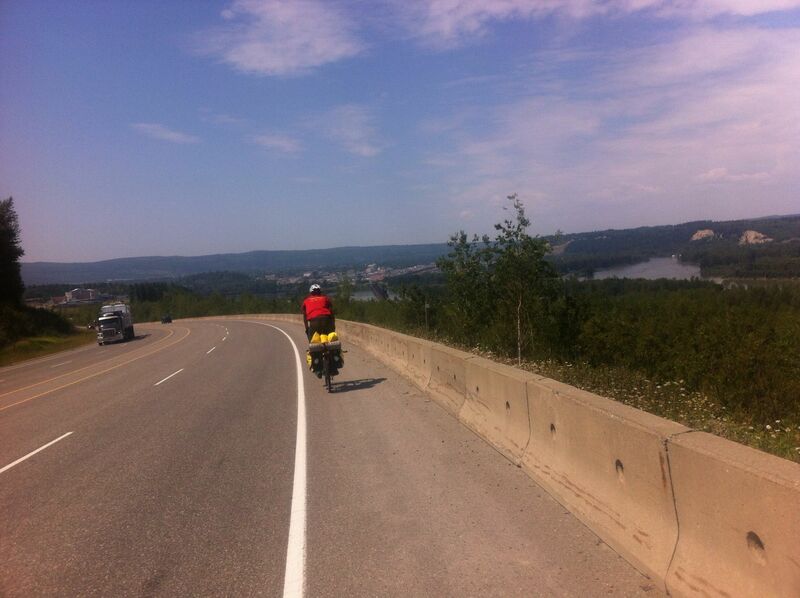 On our way out of the campground, John and I stopped to chat with a German couple cycle touring across Canada. The beginning of the ride was nice, but a few miles out of PG we turned a corner from wilderness to an alien universe of industrial ugliness. We were hungry and stopped at the first gas station, where I caved to the lure of cheap hot dogs. When you’re really hungry all the time, junk food is hard to resist. I did not like PG and was very grateful for the security of John’s company. As we made our way across town to run errands, I felt more and more confused about how a university town could feel this derilect and uninvitig. We made our way to the home of our host- the wife of Trevor-the-cyclist-I-met-at-mt-Robson. We dropped off our gear an cleaned up a bit, then went back in to town to satisfy my hankering for tacos. When we got gone, Liz started the bread maker for us for breakfast. After a luxurious breakfast of fresh homemade bread and cold cereal (milk being a refrigerated commodity), John and I embarked on a sweaty ride. We -remarkably- made it out of PG without getting hit by cars or running over any tire-puncturing debris. 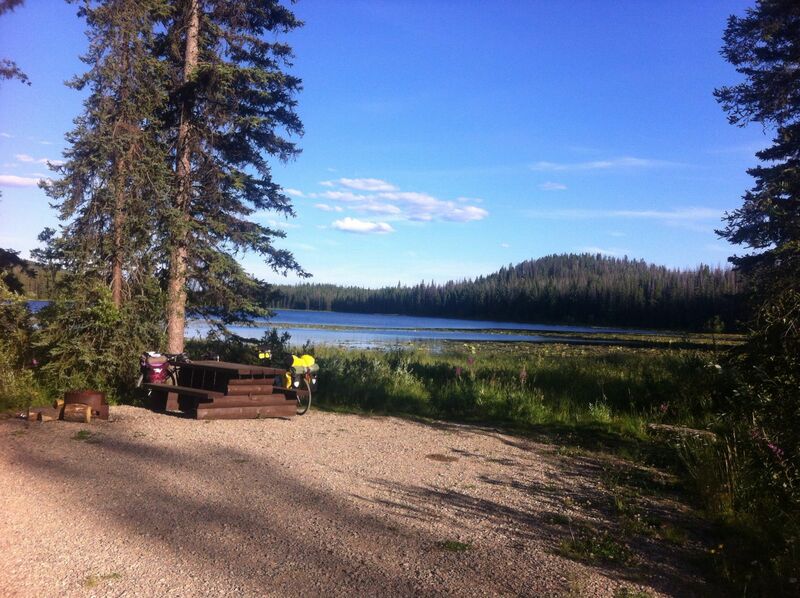 The remaining 60 miles to Vanderhoof were some of the least pleasant of the trip – lots of logging trucks and rude drivers who passed too close, narrow and gravelly shoulders, hot weather, and no scenery (just scrubby trees). We took a late lunch at a rest area and plugged on through to Vanderhoof. The ride was redeemed by a large and affordable ice cream cone in town before riding up the hill to meet our gracious warmshowers hosts at their beautiful log cabin. Their golden retriever and her adorable puppies greeted us, and we were promptly showered, offered refreshments, and encouraged to bask In their marvelous massage chair. My back is so grateful. An excellent dinner was followed by good conversation and cookies with tea. rThanks a million to John&Jolinka for providing such a relaxing respite for John-the-cyclist and me! This day was really hard. Big headwind, no scenery, too many logging trucks passing too close, bad pavement on the shoulder and a really strong,consistent headwind ALL day. We took a long lunch at Fraser Lake in hopes the winds would die down, but no luck. By 5pm we were still riding, discussing camping options short of Burns Lake and water availability, when an older lady pulled up and offered us each an ice-cold bottle of water. It was so kind andexactly what we needed on such a parched afternoon. We decided to push on the remaining 15-20miles to burns lake, knowing it would be exhausting, but another 2-3milesdown the road we came across a sign for camping at co-op Lake, 2km off the road. We were tired, so we went for it, knowing we could filter water from the lake. The campground was beautiful and deserted except for one fisherman. I slept without my rain fly on my tent and it was great. I Got up with the sun and was ready to ride. The first 2mi down to the highway were scary on fully loaded bikes – I felt like I was going to lose traction at any moment. John and I talked to an interesting German cyclist for a bit and continued into Burns Lake where we refueled from yesterday’s depletion at a GREAT breakfast cafe with one of the best cinnamon rolls I have ever had. The rest of the ride was quite hilly, but with minimal wind it wasn’t so bad. We saw a black bear on the side of the road a few miles before we arrived in Houston, home of the worlds largest fly fishing rod. After ice cream, we backtracked to the RV park on the edge of town, just a couple dollars more than the municipal campground a 5km hike up a gravel road, and with much-needed showers. We decided we were both too tired to cook dinner (and of eating camp food- with 2 weeks of remote riding in the future, each opportunity for real food should be seized!). We asked the campground hosts about delivery pizza, and they insisted we borrow their truck (nobody delivers). So john and I drive the 1km back to town, ate pizza, and went to bed early.